I’ve been spending most of the time using the new 7.8-inch Kobo Aura One lately, but Kobo also has another new ereader called the Kobo Aura Edition 2. It has a 6-inch E Ink screen and it uses an older version for some reason with lower resolution. Most newer ereaders have 300 ppi screens, but the Aura Edition 2 only has 212 ppi. Admittedly I’ve hardly touched it since I got both new Kobos at the same time, but I’ve used it enough to question the reason for its existence. I still can’t figure out why Kobo released the Kobo Aura Edition 2. It makes no sense on any level. It has no distinguishing features that separate it from other Kobo models whatsoever. It doesn’t have built-in OverDrive support like the Aura One. Nor does it have an auto-adjusting frontlight—the dot above the screen servers no purpose. 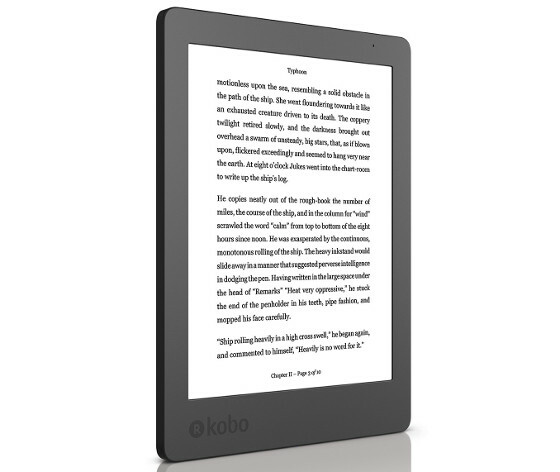 The original Kobo Aura set itself apart by having a premium design with a flush glass screen; the Kobo Aura 2 has neither of those. The worst thing about it is the lower resolution screen is a noticeable downgrade from the Kobo Glo HD, which only costs $10 more. The frontlight also doesn’t seem as good, but they vary so much from one to the next that it’s hard to say if they’re all like that. So what is the point of the Kobo Aura Edition 2? It’s like Amazon re-releasing the Kindle Paperwhite 2 and selling it for only $10 less alongside the Paperwhite 3. It makes no sense to do something like that! I could see the reasoning behind it if they sold it for like $99. But at $119 it’s the same exact price as the Kindle Paperwhite 3, which of course has a 300 ppi screen. Perhaps Kobo is going to discontinue the Kobo Glo HD. They have no reason to do so but it just happens that the Glo HD is listed as out of stock at Kobo’s website and at Indigo’s website. Agreed, it’s baffling. If the Kobo Glo HD is discontinued, they won’t have any 6″ 300 ppi model. It could be that they’re trying to push the big thing that sets them apart from the Kindle — larger screens — at the expense of 6″ models, but why replace the Glo HD with a lower-res model? This may have more to do with currency exchange in the countries where Kobo has more traction. It seems to be a cost saving measure. If there is no price elasticity with buyers they’ll need to lower the costs somehow. If the Glo HD was not a profitable device its replacement can’t have the same base level material costs. Amazon can “rob Peter to pay Paul” with the Paperwhite’s costs ( in addition to squeeze better margins with better market intelligence & ads ). In the upcoming holiday buying season rush, I suspect Amazon will have sales prices and challenge Kobo to a “how low can you limbo” contest. The lower screen cost will keep Kobo in that game. P.S. the true follow on to the Glo HD would come back later (next year? ), but probably at a higher price point that was more sustainable. As the margin and revenues on ebook prices fall, the devices are going to have to pay for themselves up front. Yes, a strange model. The Kobo Glo HD at $10 more is a much, much better purchase. The design of Edition 2 is nicer than Glo HD’s. I think. They have discontinued the Glo HD. It is no longer available for purchase on their website. My Glo HD just died, and they are trying to get me to accept an Aura Edition 2 as a replacement. The mind boggles. My Glo HD also died after 2 months of use (will not charge). They have offered a Aura 2 as replacement which feels like a step backwards. To understand why someone would buy this product, you need to think from a user perspective. The Aura ticks all of these boxes at a very nice price point. As an Edition 1 user the new version looks a bit fresher and more comfortable. So maybe not an upgrade, but for a lot of people the perfect entry model. Sometimes the unique selling point is practicality instead of feature boasting. I brought one some time ago. Immediately realised my mistake and was fortunately able to return for a full refund to where I brought it from here in the UK. The screen in particular was disappointing with noticeable ‘shadowing’ around the edges of the same. I now own an Aura One which I use a lot and its hard to Imagine why Kobo would demean the ‘Aura’ brand with this vastly inferior product other than for the purposes of a cynical ‘cash grab’against the unwary on their part and for which they should be ashamed. Avoid! I love my Aura 2nd edition. I have been using it for over a year and have no problems with it all. The screen lighting and resolution is fine (I often read in bed at night). It’s a good, small size that fits in a bag or pocket with ease and it weighs next to nothing. Upgrades are frequent and easily obtainable. Buying books is simple and fast. I don’t know why there so many complaints! (PS the price is good too). There seems to be a lot of dislike when it comes to the Kobo Aura Edition 2. Personally, design-wise, I love that the side bezel is slightly raised above the screen. this prevents me from accidentally turning the page while I hold the device. Secondly, the difference between 212 and 300 ppi makes no difference to me. My previous digital reading devices were a Nook H.D 7 inch tablet, a 1st gen Nook e-reader, and a venerable but still perfectly functioning Sony PRS 700 e-book reader. Compared to these devices, the Kobo is a Ferrari amongst rusty pick-up trucks. I love that I can organize my books into collections, and bought it specifically because it supports many open source file formats–unlike the Kindle. I also appreciate the little things, like being able to “fatten” up the font as well as change it’s size and type into a wide variety of combinations types. The activity option allows me to keep track of my reading in a number of ways such as percentage read, total books read and unread, how much I read at a sitting, as well as the total number of hours read to date. The Kobo bookstore seems well populated with a large number of books and recommends novels to me based on my reading habits. There is even a rudimentary Beta web browser so articles and web posts can be copied and saved for later reading offline in Edition 2’s “pocket’storage feature. the battery life is exactly as advertised, and I am still trying to get used to the pleasant option of being able to go weeks between charging the device–even though I am an avid reader and spend many hours of the day enjoying my books on my new Kobo. Thanks to those who favour the Kobo Aura 2. To-day I ordered one after weighing up pros and cons. Now I shall seek a comfy cover !